“Duel on Yew Ridge” by Don Stivers is the cover illustration of Daniel Beattie’s new book. Join us as we celebrate 20 years (1989-2009) of effort by dedicated volunteers to conserve and protect the historic rural character and the Civil War battlefields of the Brandy Station area within Culpeper County, Virginia. Dr. Beattie commissioned three original paintings by Adam Hook for this book. He has generously donated the originals to the Brandy Station Foundation. They are called: Save the Day! ; Buying Time on the Beverly Ford Road ; and, Buford on Cunningham’s Ridge. We will be proud to display them at the annual dinner and thereafter at the Graffiti House. Dr. Daniel Beattie is a native of southern New York. He earned a BA at the City University of New York, and a MA and PhD at Duke University. For many years he served on the Boards of Trustees of the Association for the Preservation of Civil War Sites (as Secretary) and the Civil War Preservation Trust (as Chairman of the Battlefields Preservation Committee). He has received the highest Preservationist Award of both groups. He was a member of the Shenandoah Battlefields National Historic District Commission, which set up the present Foundation of the same name. He sat on the Board of the Brandy Station Foundation for about 10 years. He has been instrumental in saving each of the parcels of land preserved on the Brandy Station battlefield. He has conducted guided tours of many American and European battlefields. He lives in Charlottesville, Virginia, with his wife of 34 years, Peggy, and two children. Mr. Dusty Rhodes of the Little Fork Rangers donated a beautiful Civil War era gown. It is French, circa 1861 with an unusual repeated pattern. It would have been a lady’s “Sunday Best”. The dress will be displayed at the Annual Dinner. 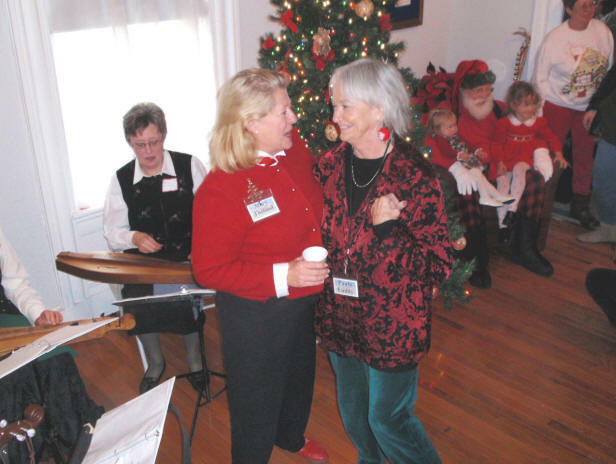 A great time was had by over a hundred people at the Christmas Party in December. Santa Claus (i.e. Dale Brown) listened to young and old; Robert E. Lee (i.e. George Wells) graced the party, and The Wilderness Run Players provided beautiful dulcimer music. Carolyn and Jack Reeder were present to sign copies of their new book published by the Foundation called From a True Soldier and Son: The Civil War Letters of William C. H. Reeder. 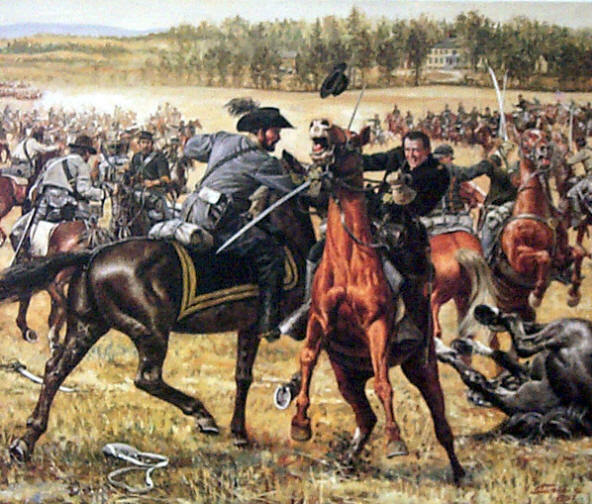 Thirteen of young William's letters to his parents were datelined either Encamped near Culpeper or Brandy Station. Karla Sedeita brought her gourmet food to add to the Graffiti House gift shop items--from peaches to peanuts and mulling spices. chat at the BSF Christmas party. Wilderness Players to the left, Santa to the right. Rangers and 6th Virginia Cavalry) signs the wall. 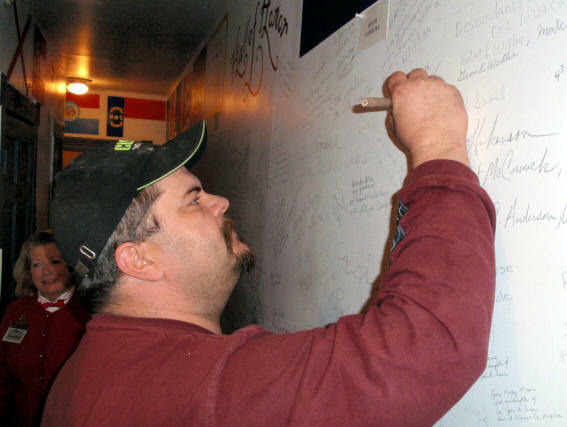 Visitors to the Graffiti House are invited to sign a 21st century Wall of Honor downstairs if they have a relative who was in Brandy Station with either Northern or Southern troops. Visitors are asked to sign their relative’s name and unit if known and then their name and relationship. Signatures from many states are displayed! Many enjoy this unique connection between the present and the past. Tours leave from the Graffiti House at 10:00 am and last 2 hours. Cost is $10.00 for adults, children are free. No reservation needed, just show-up at Graffiti House before ten. For info contact Gary Wilson at 540-547-4106 or email BSFJune91863@aol.com. Full tour schedule at www.brandystationfoundation.com. Special tours for individuals or groups on other days can be specially arranged. On July 1, 2007, the Brandy Station Foundation was awarded a grant in the amount of $14,250 from the Department of Historic Resources of the Commonwealth of Virginia. In order to secure this grant, the Foundation matched this amount. The investigative phase of the restoration project is complete and initial stabilization of four areas of the walls has taken place. This has used up the grant money from the State. The Foundation would like to thank Virginia State Senator Edd Houck and Representative Ed Scott for their support which resulted in the approval of this grant request. Phase I for the restoration of the House is to stabilize the main floor framing to make it safe for visitors. This will be at a cost of approximately $28,000.00; this work will begin very shortly at minimal impact to visitors. A Phase I Oversight Committee has been formed ; the Committee will contract the project to a qualified vendor after receipt of a valid contract. The report gives an estimate for Phase II, the stabilization of the 2nd floor, a cost of $74,000.00 . Funds will need to be raised for the project. If you would like to contribute to this project, please send a check to the “Brandy Station Foundation” and write “Graffiti House Restoration” in the memo line. Fauquier County High School students work in the backyard of the Graffiti House. The Civil War Preservation Trust, in coordination with the History Channel, will be sponsoring "Park Day 2009" on Saturday, April 4. This effort involves well over a hundred Civil War sites across the country that encourage volunteers to come out and help maintain these areas of historic importance. In the past, Volunteers at the Graffiti House have cleared trails, planted trees, weeded and mulched the gardens. The trail at Kelly's Ford has been kept open over the past few years because of this effort. Anyone who wishes to help can show up at the Graffiti House at 9AM on April 4. Please bring work clothes and gloves and any landscaping tools you have. For more information, contact Richard Deardoff at deardoff@comcast.net or 540-937-7718. Fauquier County is sponsoring a free Civil War Symposium on March 28, 2009 from 8 AM-5:30 PM at the Fauquier High School Auditorium in Warrenton, Virginia. The symposium is titled “Bivouacs & Battlefields: the Civil War landscape of Fauquier County”. Author Gary Adelman, from Historic Associates Incorporated and a Gettysburg licensed battlefield guide has been compiling the majority of the information with input form various members of the historical community. Michael Block from the Brandy Station Foundation is on the committee that is overseeing the effort. Confirmed speakers include Robert K. Krick, Gary Adelman, Bud Hall, Bob Zeller, and Childs Burden. This event is FREE! Lunch will be available for purchase. The Brandy Station Foundation will have a table at this event with information and articles for sale. Pleases send your dues in by April 1, 2009.